Samsung Galaxy Tab 2 10.1 is bit heavier and less slim as compared to its predecessor. It still features the plastic blackside but replaced with titanium silver as compared to white. The tablet can be hold comfortably in the hands of users, but little wide which makes it a bit awkward. If hold in landscape mode, the top edge of this tablet makes out five different features – an IR blaster, 32GB-capacity microSD slot, headphone jack, volume rocker and power/sleep button. Apart from this, two long speakers are placed vertically along the right and left bezel. Microphone pinhole and dock connectors are also placed along bottom edge. 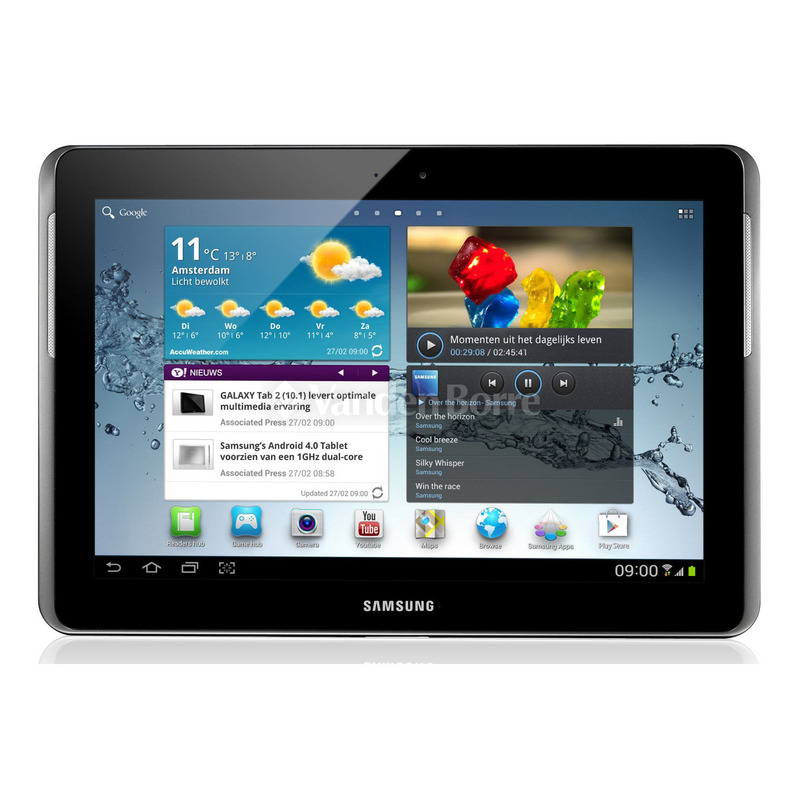 Samsung Galaxy Tab 2 10.1 offers extensive features with very few exceptions. The device includes 2.0 MP front-facing and 3.0 MP rear-facing cameras. However, LED-based flash is absent making low light photography almost impossible. But the device now comes with infrared blaster apart from highly recommended microSD slot which removes the limitations of less internal storage space. The gadget seems to be built on similar durability standards as they were in the Galaxy Tab 1. Samsung’s this device differ in slight manner with Galaxy Tab 2 10. It comes with reduced specification, which helps to keep the overall price far below its competitor iPad. Though externally the device appears very similar to its predecessor, from inside it has less RAM and slower processor which saves substantial cost. The unavailability of 3G models in UK as well as other versions means the tablet is not equally competitive to the new iPad. If this device is upgraded with Android 4.1 Jelly Bean, along with UI enhancement then it would become extremely smooth. Even after running Android 4.0, it will not impact on the performance. It handles heavy websites and OS with perfection. You can see site like BBC News running in just seven seconds. The life of battery is decent which offers backup of more than 8 hours. Though it lasts for lesser time than its predecessor, the backup is well enough to watch any long film. Though the pixel count of Samsung Galaxy Tab 2 10.1 is slightly lower than its other rivals, the quality of screen is awesome. Spectacular viewing angles result in display which can be comprehended at any orientation. Dark blacks and vibrant colors makes maximum out of the content you are viewing. The Samsung Galaxy Tab 2 10.1 is nicely designed tablet with potent speakers, expandable storage and responsive design. It comes with high performance, multi features and more value as compared to other similar tablets available in the market. However, the tablet is slightly overpriced and the dual core CPU of this gadget faces trouble in running 1080p movies. Its accuracy of screen color cannot match with its predecessor.